In spite of the blockade on world media by the government of Israel, the news of the horrors of Gaza did get out to the world. Residents and a few foreign aid workers who had managed to enter during the two years of the lockup of Gaza, as many citizens called it, an open air concentration camp, did manage to get first hand and immediate reactions, stories and images of the brutal invasion and attack to a horrified world. The informal independent media got the news out. 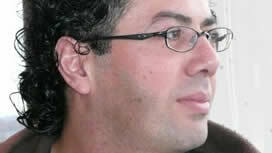 Ramzy Baroud was born and raised in the largest Gaza refugee camp; his parents as many Gazans were internal refugees from other parts of Palestine fleeing the violence of He says that Israeli public relations use reductionist concepts and language to mask their own policies. Palestinians are reduced to Gazans; they are reduced to masked men and martyrs – their humanity and the reality of their lives are ignored. But he reminds us that all Palestinians are connected by struggles and aspirations – as well as blood relationships. After two years of total blockade Israel planned this invasion carefully and planned it to be the most brutal since 1967; 1,443 killed, many more injured, thousands of homes damaged and destroyed. Baroud says that even as the global corporate media learns about events from independent sources, it is not prepared to and will not challenge Israel’s actions. But Gaza is about real people; Baroud says there is no despair or giving up. People bury their dead, life goes on; people survive, rebuild and carry on. Even at funerals they don’t just serve the traditional bitter coffee but honeyed sweets as well. He emphasized that, “If people are pushed to the brink, they concede or fight.” And Palestinians have not conceded. The support for Hamas is rooted in resistance, hope and opposition to elitism and corruption of what many see are collaborators in the Fatah leadership. Israel ignores all land laws and rights; all land is controlled by Israel. Baroud believes as do many others, that Israel wants the land and not the people. He says it is true many are leaving, including Christians, but the population is growing and most Palestinians are committed to staying on their ancestral land. Israel fears the Palestinian population growth, as its own numbers shrink. An NGO industry was created to support moderate pro-Oslo Palestinian groups and governments. Those opposed to Oslo were isolated and punished. Some small support was given to Hamas to “balance’ Fatah and follow the old ‘divide and conquer’ dictum. But mainly Hamas’ resistance to occupation was and is seen as a threat by Israel. For Palestinians weary of its government’s complicity and corruption – Hamas is seen as an honest alternative, dedicated to peoples’ social and economic needs. Only 3% of Palestinians believe in Islamic Law, secular government is part of Palestinian history, but many would choose Hamas to represent them with honesty and dignity. Beyond its borders, Baroud says that it is feared that an independent Palestine would create a domino effect in neighbouring countries, like authoritarian Egypt and Jordan, where people would demand democracy Both these are client states of the USA where there is little mention of the “Democracy Project” of the USA. 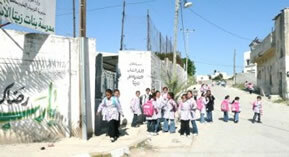 School girls near Tubas, Palestine. Palestinians love their children and believe a good education will prepare them for a better future. How do we take a stand? Baroud urges us to relate Palestine and all issues of injustice. Recognize our own power. He says the reality is that we can affect the outcome if we try. Help organize medical help, send doctors who will return and tell what they see, inform others in our community, lobby all politicians and political parties. “Change begins with us.” Reach out to other communities like sports – Baroud and others raise funds for children’s project in Palestine by running in marathons. Palestinian poetry, prose, film and art reach many people not previously involved in solidarity action. Palestinians will resist until they are free – the solution is up to them It is our role in international solidarity to do what we can where we are – support resistance media, create a more conscientious society at home. Support peace activism within Israel as well as in Palestine. Buy Palestinian Fair Trade Olive oil; an Anglican clergyman told us that the Anglican Church uses it for sacramental purposes. Baroud believes that the Israeli propaganda war is failing – independent media and activists are succeeding. We can support it with funds and our active participation. New groups are forming everywhere; many people of Jewish ethnicity are publicly opposing Israeli policies and wars. Palestine support is growing across Canada. Boycotts and divestment are gaining support. During the Gaza invasion and the continuing blockade Canadians have been generously donating aid for Palestine. Writing for many international publications, he is also the author of The Second Palestinian Intifada: A Chronicle of a People’s Struggle and editor of Searching Jenin: Eyewitness Accounts of the Israeli Invasion. In October his latest book on Gaza will be published by Pluto Press. He now lives in the USA with his family.